On Texel Airport (Netherlands) the first European fly-in cinema took place. On a 40′ x 20′ inflatable movie screen the blockbuster “Top Gun” was shown and spectators were able to watch it out of their own plane! Classic aircraft from all over Europe were part of this unique event. The DIFF is celebrating its 10th anniversary this year and is predicting its most extravagant show yet. From the 6th-14th December 2013, Dubai becomes a hotbed of international movies and film stars as the world comes to celebrate the movies of the year and some very special premieres as well. Not only is the festival an excellent opportunity to promote Arab Cinema but is now considered to be one of the leading film festivals in the world. 174 films and documentaries will be shown during the festival at a number of venues all over Dubai. As well as this, there is an awards ceremony with A-list movie stars such as Martin Sheen and Cate Blanchett in attendance during the festival. One of the stand out venues though is at Burj Park in downtown Dubai where a free event called Screen on the Green is taking place. On a giant 20m x 10m (66ft x 33ft) inflatable movie screen over 1,000 guests will be able to enjoy the magic of film at the foot of the world’s largest building the Burj Khalifa. Films from the Arab world and further afield will be shown here from the 6th-14th December on the AIRSCREEN. The Amsterdam open-air cinema season has drawn to a close for this year ending with a spectacular drive-in event in the city. Over 8 days spectators were treated to a diverse selection of films including ‘Blues Brothers’ and ‘Thelma & Louise’ all shown on a giant 12 x 6m (40′ x 20′) inflatable movie screen. There were over 60 cars in attendance as well as a large number of walk-in audience members who came by foot or in true Amsterdam style by bike. Guests were not only treated to blockbuster films but also DJ’s ensured that the musical atmosphere was equally as exciting for those in attendance long after the film was over. Guests didn’t even need to get out of their cars to pick up refreshments, but instead ordered whatever they desired via SMS from the comfort of their cars and their food and drink was delivered straight to their vehicle. Eat|See|Hear is an outdoor event series bringing movie lovers and food enthusiasts together. In several locations around Los Angeles movies are shown on the largest outdoor movie screen on the west coast. In front of the three stories tall and 52 feet wide inflatable screen Californian bands are playing prior to the screenings. Also starring: new food trucks every week. With tons of special food and such outstanding movies like Raiders of the lost Ark, Ferris Bueller’s Day Off, Pulp Fiction or Breakfast Club Eat|See|Hear invites you to lean back and relax. In fact it is better than a picnic and you don’t even have to bring a basket with you! Set against the spectacular backdrop of Kirstenbosch Botanical Gardens, The Galileo invites Cape Town locals and visitors to a memorable movie experience under a ceiling of stars. Cape Town’s only outdoor cinema uses an inflatable screen with a rear-projection surface to show a movie once a week. Besides price-winning documentaries like “Food Inc.” or famous foreign films like “City of God”, visitors can watch some of their all-time favorites: “Forrest Gump”, “Pulp Fiction” or “E.T.” – just to name a few. Delicious snacks are also offered, blankets and chairs can be hired. Gerlinde Kaltenbrunner is one of the most successful female mountain climbers worldwide. Her husband Ralf Dujmovits was the first German to scale all of the infamous 8,000m mountain peaks worldwide. 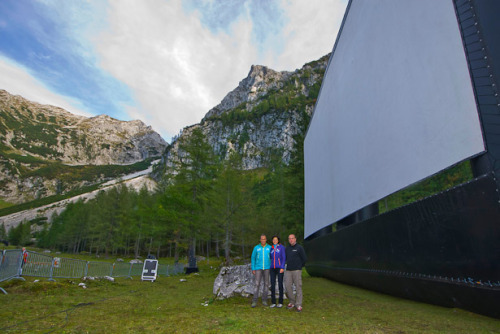 The pair gave a multimedia presentation in front of the ‚Holzeralm’ mountain range. 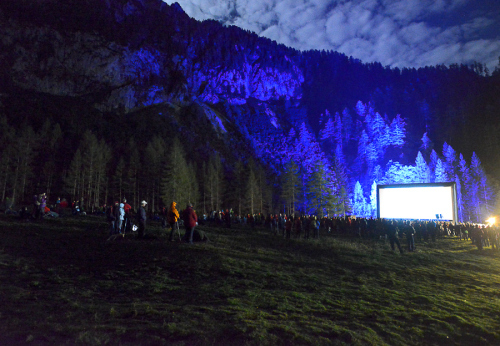 The couple used an inflatable screen for their presentation and this meant that the enchanted viewers were able to watch the presentation on best quality screen technology, high in the mountains of Austria. The presentation aptly named ‚ Passion 8000 – depth everywhere’ was presented by the couple. Of special interest were the background histories, which gave the audience the opportunity to really hear about what it takes to be an extreme climber. What made the presentation so worth seeing was the fact that the pair also showed the setbacks they incurred, not only the positive aspects. The setbacks included some near death experiences, which the couple were able to talk about and entertain their audience with. The AIRSCREEN Company recently installed a 6.10m x 3.43 inflatable screen on the beautiful Canary Islands. An introduction to the technology and how the screen works was given in Fuerteventura itself from one of the AIRSCREEN Company’s highly trusted technicians. This was all done to allow for a brand new attraction to be opened in the hotel, namely an open air cinema for all coming guests to enjoy. Fuerteventura, or as the locals call it, Paradise Island, has the perfect climate for open air cinema, with long warm nights allowing for blockbusters to be shown on the big screen without catching a chill. The open air cinema season is not too long away and we are hoping for a long warm summer for all to enjoy the romance of open air cinema with AIRSCREEN.